PC'd, GC'd and Swaged boolits! Thread: PC'd, GC'd and Swaged boolits! Brought up the idea of swaging cast lead boolits for better accuracy many years ago. Always new it worked well as I would use the lead boolits to set up my swage dies and check for proper diameters, but never got around to really testing the full potential of improving a cast boolit by swaging it in a swage die. I have had a few customers already doing this very thing for quite a while, swaging both powder coated (PC) as well as lubed and naked cast boolits and have reported back with excellent results vs. the unswaged boolits. 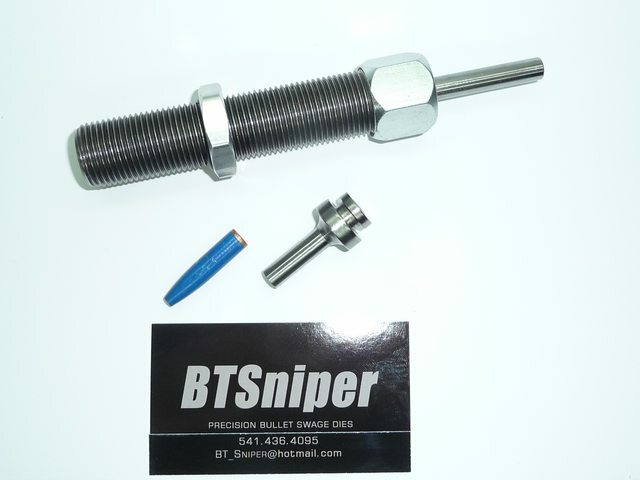 Swaging these cast boolits should allow for increased accuracy as it will eliminate any voids, true the diameter around the entire bullet, eliminate any runout (bend) in the nose or entire bullet, secure a perfect gas check and even add a hollow point should one desire. 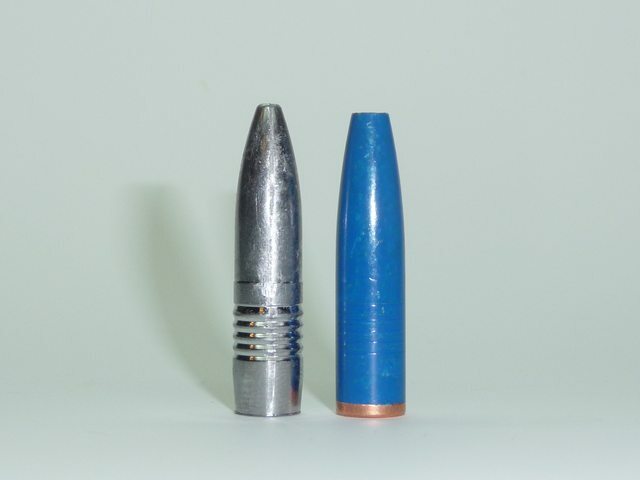 What I have here is a 230 grain 30 cal cast boolit (I happen to use for a core in my 315 grain .375 bullets from scrap 223rem brass) that I casted with pure lead, then I powder coated it using Smoke's blue powder (vendor here) and last I swaged it with a simple 30 cal gas check in a simple 30 cal swage die. What is the diameter of the front half of the swaged boolit? If it is over 0.300 inch in diameter it will not fit in my 300 Blackout. Just staying at home and playing with multi-color boolits. It's full 30 cal diameter at .308 but it has a longer 10s ogive nose to it. I'll have to look into 300 black out abilities. People are shooting 220 grain Sierra match kings right? This bullet is no longer then the 220 SMK. I'll have to do some more research and certainly appreciate the info and ideas. What sort of luck have you had with the 300 blackout? I am still working on the sub-sonic loads to fully cycle my AR. The super-sonic loads work great. You can load a BLK at 2.585 but it's going to be really close in the mag. The length isnt really the problem though. They just dont like stubby fat bullets with pig noses. I have read the pistol length gas system is best to cycle the 300 blackout. I've been messing with PC'ing cores and then swaging lead bullets as well. I'll have to put some examples together. I never could get NOE's 249 grain bullet to work either. A nose swaging down to about .299 or .300 might do the trick though. When you guys say "could not get to work" what do you mean? Not accurate? Did not cycle? Did not feed? seated too deep? etc....? For me it was difficult chambering. The bullets stayed in the bore if you tried to eject a loaded cartridge. High pressure signs despite mild powder charge. Lighter, shorter bullets work just fine. Wherever the rib in the mag (for a AR) is, is what the bullet diameter that measures .250 should be seated at to allow feeding from the mag. **** that looks nice. If gas checks werent so mind boggling expensive here, id want one.... That just says 30 Herrett metallic silhouette. Last edited by ReloaderFred; 04-09-2018 at 12:51 AM. secure a perfect gas check With a good mould and casting procedure THIS is the reason I'd go for a swage die. Push through doesn't provide enough body pressure to get a good (perfect) GC installed. Pistol gas is probably better for subs, carbine works great for supers. The AGB is 'stuck' on my 10' pistol from PB PCd, need to drip some 'cleaner' in it to remove the Pb. Brian, what is your availability? I’d like to call you but don’t want to impose. Thanks in advance. Yes, pretty busy machine dies at the moment. But feel free to call and leave message, I'll get back as soon as I can. The 30 looks very interesting. I have posted a number of times I believe swaging is the only way we are going to acheive full power loads with accuracy at distance (100+ yards) with powder coating. A single die would make the process manageable. Are there any plans for dies for the bore-rider bullet designs that have already proven to be a solution? a Hemispherical Base Ejector to seat gas checks. 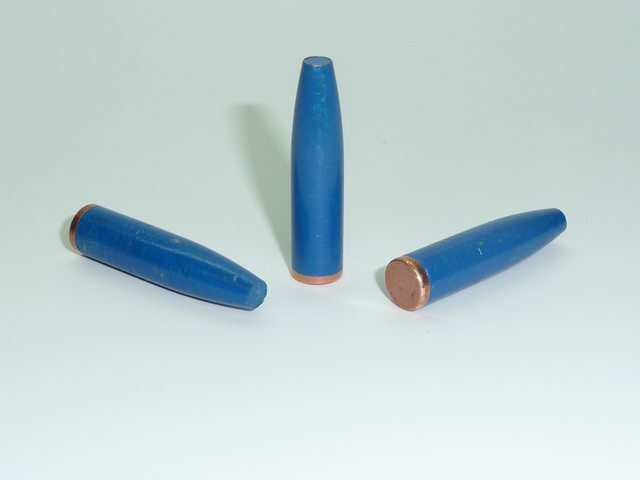 These were used for EXTREMELY effective explosive bullets that DID NOT BLOW UP IN THE BORE! Hemispherical GAS CHECK BASE prevented Bad News "bore explosions"
from burning powder gas creeping up thru "casting imperfections". (Shootin’ resulted in 1 1/8 inch holes in usual sheet metal. Last edited by GONRA; 04-25-2018 at 06:33 PM. I'm getting good results doing this with 170 grainers in my FN PBR .308 but not in my Ruger RPR (yet). I cast them, reduce them to .308 and add the gas check at the same time, run them through my point former to get the profile I want and square up that gas check, then powder coat them with Eastwood powder and reduce to .309 instead of .308. 30 grains of IMR 3031 will consistently get me sub 1 1/2 inch groups at 100 yards with the FN. For some reason, they don't seem to like that 5R rifling in the Ruger. Perhaps I need to reduce to .310. I use hard lead alloy and swage very lightly. The profile is changed very little so the bullets are what I'd call monolithic flat noses with a 6S Ogive. Brian, does the coating provide sufficient lubrication for the swaging, or do you also give them a little extra something? Ive been swaging PC coated bullets in Brian's dies for some time (357 Maximum, 44 Mag, 45 Colt, 458 SOCOM). I have never needed any additional lube other than the PC.